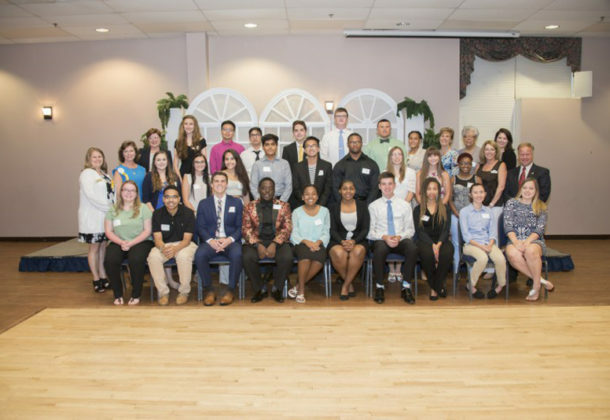 For the 19th year, College of Southern Maryland Foundation and the Greater Waldorf Jaycees Foundation worked together in June to award scholarships to Charles County students both entering and returning to the college. The foundations jointly presented scholarships to 16 new CSM students and renewed the scholarships for 15 returning CSM students at the 2018-2019 Scholarship Awards Reception at the Greater Waldorf Jaycees Community Center on June 13. The scholarships added up to $66,500. “As the president of the College of Southern Maryland, this is my favorite time of year. It’s a time of completion, seeing our students’ realize their dreams, and a time for new beginnings,” said CSM President Dr. Maureen Murphy. Calling the scholarship recipients “future leaders, teachers, artists, engineers and scientists,” Dr. Murphy lauded the students on their successes and praised the support of their family, friends and career counselors. CSM Foundation Chair Nancy Hempstead also congratulated the recipients and complimented the Great Waldorf Jaycees Foundation for its continued support. Over the past 19 years, the Great Waldorf Jaycees Foundation and the CSM Foundation have worked together to award 484 Charles County students a total of more than $1.2 million through the scholarship fund. “We are honored to partner with the Great Waldorf Jaycees Foundation in working toward a common goal – to invest in students,” Ms. Hempstead said. The 2018-2019 scholarship recipients are: Christian Brady of Waldorf, Aija Johnson of Waldorf, Danielle McCann of Brandywine, Elaina Dixon of La Plata, Hayley Tanner of Indian Head, Matthew Santos of Waldorf, Jada Duckett of Waldorf, Jhaqori Campbell of Bryans Road, Katelyn Kluh of La Plata, Kaitlyn Sloan of Welcome, Kylie Wade of La Plata, Matthew Gaines of La Plata, Micco Simms of Bryans Road, Parshva Patel of La Plata, Sufyan Ansari of Waldorf, and Yanelle Montilla of La Plata. The renewed scholarship recipients include: Ankit Lohani of Waldorf, Ashley Fenton of Waldorf, Jenna Purdy of La Plata, Brittanie Durham of Waldorf, Caitlin Addison of Waldorf, Meeklyn Duhon of Waldorf, Dawson Jewell of Charlotte Hall, Jada Proctor of Nanjemoy, Jean Luc Montilla of La Plata, Jordin Dixson of Waldorf, Megan Caudle of La Plata, Morgan Hanson of Port Tobacco, Savannah Simmons of La Plata, Seth Morrison of La Plata, and Tristan Sarabia of Waldorf. For more about scholarships at CSM, visit the college’s Scholarship Finder site.